Has Natural Disasters turned your Hard Drive into a Damaged or a Burnt state? Wondering how to overcome the business loss? Why worry? Stellar Data Recovery is your Anchor! Stellar Data Recovery is your most Trusted Companion for all Those Who are Looking Forward to a Safe and Efficient Burned Hard Drive Data Recovery. Our Skilled Professionals promises to extract files from both Physically Damaged & Fire Damaged Hard Drive that seems inaccessible irrespective of their make, model, or file system. We are over 2 Decades old and Best-in Class leaders across the globe for providing Burnt Hard Drive Recovery solutions. Occurrence of Natural Disasters ranging from fires to lightning strikes is beyond control. That said, they still can act as a prey to your business by damaging or burning the storage media like hard drive including the critical data: Software Applications, Software Applications, Database, Precious Photos, Inventory Files, Research Papers, and Financial Records. Are you ready to experience this Loss or Bankruptcy? All Hard Drives are vulnerable to Damage - be it Logical or Physical. Similar to Logical Failure Cases, recovering inaccessible data due to physically damaged and burned hard drive is not a big issue. Therefore, being aware of each aspect of Physical Damage and Hard Drive Data Recovery becomes imperative. For up to 100% Secure and Risk-free Burned Hard Drive Recovery, join hands with Stellar Data Recovery. An ISO 27001:2013 Certified Data Recovery Company equipped with the state-of-the-Art Class 100 Clean Room and an in-depth skilled in-house R&D team, we guarantee you solutions which are Precise, Successful & Satisfactory! We are home to Expert Professionals who dedicate their time to run an in-depth research into inspecting and fixing burned hard drive issues. How Stellar Data Recovery Ensures Data Security? If you have encountered such a situation due to any of the afore-stated reasons, count on us! 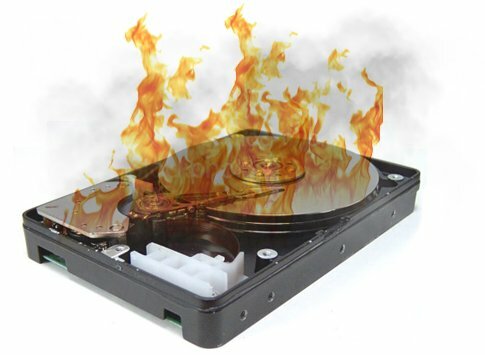 We will provide efficient Burned Data Recovery round-the-clock services. Stellar Data Recovery holds a strong foothold when it comes to Risk-Free, Professional, Dedicated, and Precise Solution to Data Recovery Burned from Hard Drive. We also value your time the key resource for business continuity. You can choose any of our service as desired to recover data with ease. Why Choose Stellar Data Recovery for Burnt Hard Drive Recovery Services? Stellar Data Recovery follows a well-organized and logical Recovery process to repair damaged or burned hard drive and extract the data from it in a safe and hassle-free manner. We strictly take into account different scenarios under which the Hard Drive experience issues, attempts to revive it, to problem surface environment. Based on this, we adopt the right problem-tackling data recovery approach which includes cleaning, protecting the data from further infection, and smoke damage repair to rebuild them entirely! Safety, Quick Processing, Reliability, and Cost-effectiveness are the strong pillars that have helped us to garner this zenith of success. Count on us for all types of Data Loss Solutions!